Leinster can seal a home quarter-final in France. 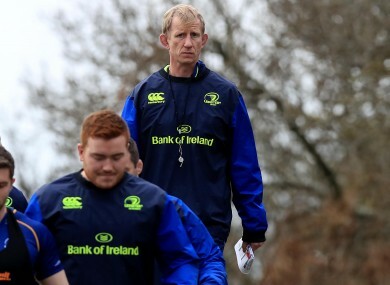 Leinster head coach Leo Cullen. LEO CULLEN HAS made three changes to his Leinster side for tomorrow evening’s Champions Cup clash with Castres [Sky Sports 2, 7.45pm]. Both Isa Nacewa and Robbie Henshaw have shaken off ‘bangs’ sustained in the victory over Montpellier last time out with the former continuing at full back and as captain. The three changes in personnel come in the pack with Cian Healy, Richardt Strauss and Ross Molony all starting. The former St Micahel’s student deputises for Hayden Triggs, who was yesterday handed a three-week suspension by the EPCR. With Sean O’Brien still unavailable through injury, it’s as you were in the back row with Jamie Heaslip, Josh van der Flier and man of the match from last week Jack Conan retained. Leinster have already assured themselves of a place in the quarter-finals but victory at the Stade Pierre-Antoine would hand the eastern province a much-coveted home tie in the knock-out stages. Email “Sean O'Brien remains sidelined as Leinster make 3 changes for Castres ”. Feedback on “Sean O'Brien remains sidelined as Leinster make 3 changes for Castres ”.